Epson, a leading supplier of value-added printing and check scanning solutions for the retail and financial industries, announced today that its newly-released TM-T88V single-station thermal printer ranked highest in energy efficiency, consuming significantly less energy than same-class competitive models. The results derive from stringent, side-by-side tests among ten competitive products performed by Seiko Epson Corporation in 20101. Ideally suited for high-volume retail and teller printing applications, the TM-T88V provides fast, reliable, full-featured receipt printing while delivering industry-leading energy savings and reduced paper usage of 25% or more. 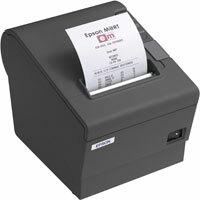 In addition, the TM-T88V is the only thermal receipt printer available today with ENERGY STAR qualified configurations. As of June 1, 2010, the TM-T88V will be shipping throughout Epson’s designated sales and distribution channels. Epson’s TM-T88V single-station thermal printer with USB interface was tested against ten same-class competitive models, including three Star, three Citizen, two Bixolon, one IBM and one Ithaca. Testing results indicate that the Epson TM-T88V uses between 68% and 89% fewer kilowatt hours as compared to the next best performing and worst performing models tested. In addition to its high energy efficiency, the TM-T88V enables users to reduce receipt length by 25% or more, without altering receipt content, by using a combination of paper-saving features including top margin reduction, line space reduction, line feed reduction and barcode height reduction. Low energy consumption and paper-saving features combine to significantly reduce the TM-T88V printer’s long-term cost of operation. Epson’s TM-T88-series is the world’s best-selling thermal printer to date, with over five million units installed worldwide. Epson, a leading supplier of value-added Point of Sale (POS) solutions, introduced its new ReadyPrint™ T20 thermal printer, a low-cost receipt printing solution for small retailers. Combining basic POS printing functionality, high reliability and exceptional ease-of-use, ReadyPrint is the ideal choice for retailers having a low volume of POS transactions and those transitioning from ECR to PC-based POS systems. ReadyPrint is the newest addition to Epson’s growing line of reliable, energy-efficient thermal receipt printers and represents the company’s entry into the growing and highly-competitive retail SMB market. ReadyPrint offers an ideal low-volume, cost-effective solution along with fast and easy integration and software included to speed application programming. Packaged as an all-in-one-box solution, the printer ships with all the components required for fast installation at the customer’s site including drivers, utilities, cables and power supply. Based on Epson’s advanced printing technology, ReadyPrint has been tested to meet Epson’s stringent design and performance standards, providing resellers with the reliable performance their customers demand. Today Epson, a leading supplier of value-added printing and check scanning solutions for the financial industry, introduced the TM-T88V thermal printer, the newest addition to Epson’s best-selling TM-T88 printer series and the latest in Epson’s growing line of reliable teller printers. With an industry-leading, four-year warranty, print speeds up to 50% faster than the previous model, and a small, sleek footprint, Epson’s TM-T88V offers solid reliability along with advanced, full-featured printing functionality ideal for high volume teller transaction printing applications. Epson, a leading supplier of value-added Point of Sale (POS) solutions, introduces its new TM-T88V thermal printer, the only POS thermal receipt printer available today with ENERGY STAR qualified configurations,* and the newest addition to Epson’s best-selling TM-T88 POS printer series. With an industry-leading, four-year warranty and print speeds up to 50% faster than the previous model, Epson’s TM-T88V offers solid reliability along with advanced, full-featured printing functionality and is ideally suited for a broad array of retail and food service applications. Epson, a leading supplier of value-added banking and payment hardware solutions, today announced that Bremer Bank has selected Epson’s award-winning CaptureOne line of check scanners to complement its remote deposit capture (RDC) solutions. Available immediately to the bank’s corporate and commercial customers, Epson’s award-winning CaptureOne check scanner enables fast, two-sided check scanning with the highest MICR accuracy in its class and an industry-leading two-year warranty. Epson, a leading supplier of value-added point-of-service (POS) solutions, announced that two of its leading POS printers, the TM-T88IV and the TM-H6000III, ranked highest in energy efficiency, consuming significantly less energy than same-class competitive models. The results derive from stringent, side-by-side tests among twelve competitive products performed by Seiko Epson Corporation in 2009*. Epson’s TM-T88IV single-station thermal printer with USB interface was tested against nine same-class competitive models, including three Star, two Citizen, two Bixolon, one IBM and one Ithaca. Testing results indicate that the Epson TM-T88IV uses between 53% and 84% fewer kilowatt hours as compared to the next best performing and worst performing models tested. Results also showed that the Epson TM-T88IV, introduced in 2005, uses significantly less energy than some of the same-class printers introduced in 2009. With over five million units installed worldwide, Epson’s TM-T88-series is the best-selling thermal printer in the POS industry. Epson’s TM-H6000III multifunction printer with USB interface was tested against three same-class competitive models, including two NCR and one IBM. Testing results indicate that the Epson TM-H6000III uses between 39% and 48% fewer kilowatt hours as compared to the next best performing and worst performing models tested. 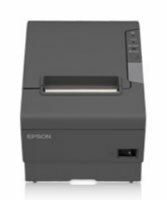 Results also showed that the Epson TM-H6000III, introduced in 2006, uses significantly less energy than newer competitors. The TM-H6000III delivers high-speed receipt and slip printing, endorsement, two-color graphics and features industry-leading MICR accuracy of over 99.9%. Today Epson, a leading supplier of value-added Point of Sale (POS) solutions, announced the availability of its TM-T70 thermal receipt printer, the industry’s only all-front-access single-station printer. The printer is designed to fit under counters and in tight spaces in specialty retail, convenience store and food service applications. With front-facing controls, front paper loading and front receipt dispensing, the TM-T70 is also a perfect fit for many kiosk applications. Its small footprint and low height, along with flexible mounting options, make the TM-T70 an ideal choice where counter space is at a premium. Unlike traditional thermal printers, the TM-T70 does not require clearance for top or side-opening, enabling it to operate in exceptionally small spaces. The TM-T70 is the first of three new Epson thermal products to be introduced over the next two quarters, and is a key component of the company’s expanding thermal printer family. With the addition of these new products to Epson’s existing thermal printer family, the company will offer the most comprehensive line of single-station thermal POS printers to satisfy the needs of every segment of the retail industry at every price point. For the fourth year in a row Epson, a leading supplier of value-added point-of-service (POS) solutions, has been voted the number one peripherals provider in the Hardware LeaderBoard 2009 published by Retail Information Systems News (RIS) Magazine. The rankings are based on a cumulative score in six categories, including Product Features and Functionality, Price and Value, Overall Performance, Technology Innovation, Support and Service and Product Reliability. With an overall score of 50.43 (out of 60), Epson was named number one peripherals vendor for the fourth consecutive year, surpassing IBM, NCR, and Lexmark. The peripherals category includes keyboards, scanners, receipt printers, electronic payment devices, signature capture pads, check imagers, biometric identification readers, pole units, screens and cash drawers. Up to 15% of delivered quick-serve restaurants (QSR) orders contain errors which result in wasted food, increased costs and dissatisfied customers. Epson’s new TM-T88IV ReStick liner-free label and receipt printer has all the features, speed and reliability you need to improve your delivery systems and reduce costs.